This shunter was built by Baguley in 1939 for the Bass brewery at Burton-on-Trent. It was number 5 in the Bass fleet, and is seen here at Brownhills on Saturday 8th September 2012. More about the history of this loco. Four industrial diesels were used at various points during the Chasewater Diesel Gala on Saturday 20th October 2007, and they worked both freight and passenger services. This is the late-running 12:45 coal train from Chasetown, seen on the approach to Chasewater Heaths at 13:06. The loco is "Birch Coppice", or more specifically Thomas Hill 134C, a visitor from the Nene Valley Railway. 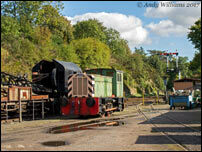 Yard shunter 319290 at Bewdley on Saturday 6th October 2012. 02003 stands outside the east end of Allerton shed. This shot was taken sometime in 1975, and the other three Class 02s which lasted long enough to be allocated TOPS numbers were dumped in various states of disrepair at the other end of the depot alongside the access road. I think all four had been withdrawn by this stage, although the last of them had not long gone. This loco was subsequently sold to LCP at Pensnett, where it carried the name "Peter" and worked into the early 1990s. It then entered preservation, and is now based at the Appleby Frodingham Railway Preservation Society in Scunthorpe. 372 (YEC2760) is a Yorkshire Engine Company 0-6-0, which used to shunt the steelworks at Cardiff Docks. It bears a family resemblance to the BR Class 02 locos, although these were 0-4-0s. The photo was taken on the afternoon of Saturday 26th July 2014, when 372 was shunting the shed yard at Toddington on the Glos & Warks Railway. This shot shows Hudswell-Clarke 0-6-0 D2511 and 08266 at Haworth shed on the morning of Saturday 18th June 2005. Like all its class-mates it was withdrawn by British Rail in 1967, far too early to acquire a TOPS number, and has now been on the KWVR for nearly 40 years. By comparison 08266, latterly a Shirebrook loco, lasted until 1985 I believe. In early 1981 Lincoln had an allocation of four vacuum-braked Class 03s, specifically 03026 03034 03149 and 03389. This picture was taken that same year and shows 03034 parked behind the station at Boston. To the best of my recall there were still two 03 duties at Boston at this time, one for the dock duty and one spare, and it was the spare engine that was parked at the station. Within two years it was all over for Lincoln's 03s, 03149 was withdrawn in November 1982 and the other three followed in February 1983. The only survivor was dual-braked 03162, briefly transferred in from Colchester before moving on to Birkenhead when the others were withdrawn. Once upon a time Barrow Hill had a small allocation of Class 03s, primarily for use at the nearby Staveley steel works. In the mid 1970s there were three such locos, namely 03129, 03189 and 03389. The latter was transferred to Stratford in about 1977, but the other two stayed at Barrow Hill into the 1980s. 03129 was withdrawn from traffic towards the end of 1981, but wasn't disposed of until 1983. Meantime 03189 moved on to Birkenhead and survived in traffic until 1986. It was one of the last, if not the very last, vacuum-only Class 03s, and is now preserved. Rides behind one of the 03s were a regular feature of Barrow Hill open days in the late 70s/early 80s, and this pic shows 03129 in action at one such event (1980 I think). Note the lack of fencing and hi-vis vests, plus the kids riding in the cab. A shot of 03189, taken a day or two before it left Bescot for Toton in August 1986. It was en-route from Birkenhead to Norwich. The withdrawn "flower pot" is dwarfed by the adjacent Cargowaggon, not the sort of thing these locos were originally built to shunt. This was originally a Fujichrome slide, but looks better in monochrome. Rodless 03196 stands near Bescot Down Tower. It was a Birkenhead loco at the time, en route to Swindon Works when this shot was taken in late July 1982. Withdrawn in June 1983, the loco is currently preserved at WCRC, Carnforth. 03197 stands amongst the Cravens DMUs at Norwich Depot in this shot taken circa 1980. Ex-works 03382 was one of the exhibits at the Swindon Works Open Day which took on Saturday 19th May 1979. Thanks to Jeff B for supplying the exact date. A picture from my second visit to the Isle of Wight. The first time 05001 was parked on the stub of the old Newport branch, just north of Sandown station. However on this second visit, circa 1980, it was parked in the platform, making it less easy to photograph. This picture shows D3022 shunting carriages from Kidderminster station to the shed, and was taken at 16:21 on Wednesday 7th May 2008. This loco carried the TOPS number 08015, and was allocated to Shirebrook in the mid 1970s. It moved to Tinsley before being withdrawn in 1980. Built circa 1953 D3022 has now spent longer in preservation than it did in capital stock. 08137 is stabled at Spalding, with shunter's pole in the usual position resting across one buffer and the coupling hook. This photo was taken in summer 1981, this long-time Lincoln loco was withdrawn from traffic in late 1982. The Polmadie Works pilot engine, PO1, photographed on Saturday 26th May 1979. Previously this had been Eastfield depot's 08173, withdrawn in late 1978. As this picture shows it was initially renumbered by having tape applied over its original number, with "PO1" simply painted above. Looking at various 1980s loco refs it seems that PO1 survived in this role until around 1984, by 1985 it was listed as awaiting disposal. Thanks to Jeff B for supplying the exact date. 08195 shunts the yard at Radyr. This photo was taken in 1981. 08202 stands in the shed at Brownhills West on the Chasewater Railway. Latterly used by the Potter Group at their Ely depot, it moved to Brownhills in January 2014. This shot was taken on Saturday 29th March 2014. In late June 2015 the loco moved to its new home at the Avon Valley Railway near Bristol. 08223 is seen at Swindon Works on the occasion of the 1979 Open Day. It was a Tinsley loco at this time, and it was at Swindon because it had incurred collision damage after running away down the bank at Tinsley - not the only loco to do this. I no longer have my notes from 1979, but I think the Open Day was on Saturday 5th May. I'd seen 08223 at Bescot as recently as Wednesday 2nd May 1979 as it headed south. It didn't survive this incident, being withdrawn in June 1979 and cut-up at Swindon in 1980. This line-up of shunters was photographed outside Colchester depot sometime in the mid-1970s. Quite why I didn't include all of 08715 is a mystery at this remove, but it may have been because 08228 was still in green livery. The other loco is 03060. This shot dates from autumn 1981, and shows 08343 and 08312 heading a line of stabled Class 08s in the depot yard at Motherwell. Note the shedcode above 08343's coupler hook. 67C was the code for Ayr, which was 08343's previous allocation. The Chasewater Railway acquired D3429 from the Telford Steam Railway prior to the 2010 school holiday period. 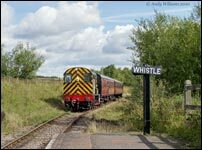 The former 08359 was in use on Saturday 28th August 2010, and is seen here approaching Norton Lakeside Halt while working the 11:30 Chasetown - Brownhills. D3429 sets off from Chasewater Heaths with a short freight train for Brownhills. This shot was taken at 14:35 on Saturday 8th September 2012, a gala weekend. 08359 leaves Brownhills West at 14:13 on Saturday 29th March 2014. This was a gala weekend, with four steam engines in use, plus Hunslet 0-4-0DH 6678 (on the right here) acting as the Brownhills shunt loco. D3429 arrives at Chasewater Heaths with a train for Brownhills. This photo was taken at 15:26 on Saturday 22nd April 2017. During the 1970s 08421 was an Eastfield loco, but by the early 1980s it had been transferred to Motherwell and was stored unserviceable. In 1982 it was sent to Swindon Works to be overhauled and fitted with air-brakes, after which it was re-allocated to Haymarket. In this picture it's seen at Bescot on the journey south. It had arrived in the early hours of Saturday 14th August, because in this view it's still formed in the middle of a freight train parked in the Down Reception Sdgs. As usual with works-bound shunting locos the connecting rods have been removed. The position of the BR logo indicates that this loco was last overhauled at Glasgow Works, as would be expected for a Scottish engine. There were several Class 08 movements to and from Bescot in the week of Monday 3rd March 2014, all done by road of course. 08632 arrived from Hoo Jct on Tuesday 4th, with 08623 going the other way. Then on Wednesday 5th 08428 departed, this one going to Toton. The photo shows 428, and was taken at 13:40 as final preparations were made for departure. The movement of shunting locos by road has now been underway for over 20 years, and is no longer a novelty for enthusiasts or the local residents. 08441 stands in the shed yard at Brownhills on Wednesday 16th December 2015. It had arrived from Goodman's yard in Wishaw (near Sutton Coldfield) that morning, in a swap with 08670 which had also spent some time on the Chasewater Railway. Both locos were in a dark grey livery with no markings or numbers. After working passenger trains on 1st January 2016 08441 returned to Wishaw later that month, before being hired out. 08461 was stabled on its home depot of Saltley in this photo from the late 1970s. Much of what's scrawled in chalk on the battery box is illegible, but what can be read says "Crossroads is saved! We love <something> + Benny". A reference, obviously, to the TV program, which was presumably under threat at this time. A Saltley loco since 1960 it went to Tyseley along with the rest of Saltley's allocation in 1983, but in early 1984 it left for South Wales. In late 1987 it moved for a brief spell at Stratford before withdrawal came in early 1988. However it took until the summer of 1991 before it was finally scrapped by MC Metals in Glasgow. On the morning of Saturday 25th July 2009 a very smoky D3586 (08471) shunts D1013 off Bridgnorth shed. D3586 at Bridgnorth again. On Monday 23rd July 2012 it was parked outside the shed, mid-way through a repaint into BR green. 08124 and 08495 are stabled at Norwich in this shot dating from Spring 1980. I'd seen 08124 many times before as it was allocated to Bescot in the early 1970s, before migrating to Norwich via Doncaster. 08495 was once a Cambridge loco, and was stored there before being re-instated to service at Norwich. I suspect both of these locos were transferred to Norwich to replace vacuum-braked Class 03s. 08538 was the Sheffield Midland station pilot when photographed here. This loco moved from Tinsley to March in the early 1980s, and this shot obviously pre-dates that move. Clearly it's not long out of the works. 08569 and 08129 are stabled on Newton Heath depot in this shot. This particular siding was alongside the Oldham line, near Dean Lane station. Again I can't remember whether this trip was done via car or train, but Manchester was another frequent "Saturday Saver" destination. 08129 has the trademark red connecting rods used by both Longsight and Newton Heath depots on their shunting locos. In late 1980 Newton Heath's shunter allocation was: 08084 08129 08475 08524 08569 08626 08675 08676 and 08677. From memory there were duties at Bolton; Manchester Victoria station; Red Bank carriage sidings; Castleton PW yard; Oldham Mumps parcels depot (which may have gone by the time this photo was taken); and a trip working to Chadderton coal depot. Another ex-works loco, 08588, stands outside the steam shed at Bescot. No date for this, but it's probably late 1970s. Bescot also had 08585 and 08590 at this time, and all three of those survive to this day. 585 was a Freightliner loco, working at Felixstowe North at the time of writing (September 2013). 590 is preserved at the Midland Railway Centre, Butterley. 588 is owned by BARS/RMS Locotec, and in 2013 was working just a few miles away from Bescot, at Cemex in Washwood Heath. 588 was built at Crewe in late 1959, so was about 20 years old when this photo was taken. There are no fewer than twelve 08s in this line-up at Bescot. Shunting engines weren't normally stabled on the Holding Sidings, they were parked on the depot. However at Christmas they would sometimes be stabled with the main-line locos (and left running) for frost protection reasons. Closer inspection of the original scan reveals that the first three locos are 08588, 08613 and 08466. This shot was originally taken as a colour slide, but has been converted to monochrome. 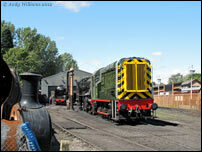 08598 stands outside the shed at Brownhills on the Chasewater Railway. The photo was taken on the morning of Saturday 14th September 2013, the loco had arrived a few days earlier from the Potter Group site at Ely. 08202 made the same move a short while later. 08601 was the station pilot at Birmingham New St in this shot taken during autumn 1986. At this time Tyseley depot had two Class 08s painted in non-standard liveries: 601 in LMS black, named Spectre; and 604 in BR green, named Phantom. 601 survived with EWS until 1999, and was eventually cut-up in 2005. 08604 in the East Dock at Birmingham New St, taken in late 1986. Converted to black and white from a colour transparency. 08605 shunts Bescot Up Yard at lunchtime on Sunday 19th December 2010. A line of five Class 08s is parked up at Swansea East Dock in this picture, which was taken in the spring of 1981. I can't remember whether we were in the car or I'd gone by train on this occasion, but it evokes many happy memories of "Saturday Saver" day trips to South Wales. Swansea outings usually involved a walk around Landore, then a longer walk to East Dock, and finally a trip out to Llanelli by train. 08660 is the nearest loco in this line-up, and although still only vacuum-braked, it was clearly not long out of works. It must have been one of the later 08s to get a works overhaul and not get air-brakes. This might explain why it lasted in traffic until November 1991, which was very late for a vacuum-only loco. The second loco is 08896, and the third one may be 08658, although it's not clear from the original scan. East Dock usually stabled five or six 08s and a similar number of 37s around this time. Nowadays you'd be lucky to find five Class 08 shunting duties in the whole of South Wales, and maybe twenty or so mainline locos. This is what was located in South Wales, or working trains to/from South Wales, on the morning of Monday 18th March 2013: three Class 60s; one Colas Class 56; thirteen DBS Class 66s; two Freightliner Class 66s; one GBRf Class 66; and two Class 67s. Just 23 locos in all, but five or six of these would probably have been located outside South Wales when this snapshot was taken. Warm evening sun illuminates 08700 as it shunts Bescot Down Storage Sidings in this early 1980s shot. During the early days of the Air-Braked Network and Speedlink air-braked freights were shunted here, whereas vacuum and unbraked trains continued to use the Down Reception Sidings and Down Yard. As the vacuum traffic fell off and the number of air-braked trains increased all traffic began to use the Down Yard, and the Storage Sidings pilot loco was no longer required. The Bescot Down Yard pilot stands on the Down Main line north of Bescot Jct while shunting wagons from the depot into the yard. This shot was taken at 11:56 on Saturday 17th December 2005. 08709 was named "Molly's Day" on Saturday 1st October 2005, after the charity event of the same name which took place at Walsall. 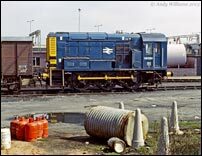 The use of the Down Main as a headshunt was a long term practise at Bescot, when I was growing up in the 1970s rakes of wagons would be tripped between the Down and Up side yards by Class 08 shunters. At the time of this photo only the movement of repair wagons (as here), or the fuel tank shunt, generated a running line shunt at the north end of the depot, but nowadays it's rarely if ever done. This picture shows 08732 stabled at its home depot of Motherwell. I've no idea when it was taken, but I believe it was the early 1980s. 08732 is the erstwhile D3900, and at this point it would have been vacuum-braked only because it still carries its BR logo on the toobox indicating that it was last overhauled at Glasgow Works. In 1982 it went to Swindon where it was fitted with train air-brakes, becoming a dual-braked loco. It returned to Scotland after this overhaul, and in 1984 it was allocated to Dunfermline Townhill. After that depot closed it went to Thornton Junction, but by 1990 it had migrated back to Motherwell. Eventually converted to 09202, it was scrapped by Booth's at Rotherham in January 2011. Saltley depot's 08742 waits for the road at Duddeston having just dropped on to the back of an ECS train from New St. It will draw the train back and propel it into the carriage shed, which is the brick building to the right. This shot was taken in 1980 and anyone who caught northbound Cross City or Walsall trains at Duddeston in the 1970s and 1980s will be familiar with the game of "guess the platform" which played itself out when an ECS was sat here. There was no warning if a local was routed via the Curzon St line, and the ECS would block your view of the approaching train. Solution: wait on the steps to get a better view. 08742 is a survivor, still in traffic with DBS in 2014. 08765 prepares to leave Bloxwich on Friday 29th January 1988. There had been no inbound traffic on this occasion, so the loco had turned up with just a brakevan around 13:00. There were three wagons to take back to Bescot, and the loco had fished them out of the smelter and run-round them when this shot was taken circa 13:30. 08774 (Thornaby), 08114 (Doncaster) and 08396 (Kingmoor) stand in Bescot Down Storage Sidings in Spring 1980. All three had recently been released from Swindon Works and arrived at Bescot as a special freight, the brake-van of which is still attached. As per normal practise they'd be split up at Bescot and continue their journey home in the consist of scheduled freight trains. Hundreds of shunting locos made similar trips to and from Derby and Swindon Works during the 1970s and 1980s. 08808 stands in the down side bay platform at the south end of Carlisle station. This picture was taken on a colour transparency, but I couldn't fix the colour casts to my satisfaction, hence the monochrome version. I was on some sort of rover ticket when I took this shot, and had done an overnight stint on Carlisle station. All I remember of this night was the cold. I caught the first DMU to Workington and back solely to warm up, but inevitably as soon as I got on the unit I fell asleep. 08827 shunts at Irvine in this shot from the late 1970s/early 1980s. The pilot loco here was provided by Ayr depot, but this one doesn't have the distinctive markings of a Scottish Class 08, namely the oversized numbers, and BR logo on the battery box, as applied by Glasgow Works. The reason is that 827 had not long been transferred north, moving from Bescot to Ayr around 1977/78. 08841 was leaving Wednesbury Exchange Sidings and heading back to Bescot when photographed at 10:45 on Tuesday 29th September 1987. Class 08s were booked to work both the Wednesbury and Bloxwich trips around this time. 08841 was one of four 08s fitted with rubber "skirts" for use in the carriage washer at Oxley, the other three being 08765, 08832 and 08901. Repeated transits through the washer were responsible for the faded paintwork, which all four locos exhibited most of the time. As an aside, the previous down train through Wednesbury on this day passed at around 10:30, and was 50048 hauling 9M01 Gloucester - Bescot. 08928 is loaded onto a road trailer at the rear of Bescot depot. This shot was taken around 13:00 on Saturday 27th February 1993. The loco was in the process of being transferred to Norwich, and the lorry departed from Bescot around 14:45. The routine movement of shunting engines by road had only just started at this time, and the loading procedure was still a bit of a novelty. Nowadays such movements are common, and somewhere around the country one or more railway vehicles, often shunting locos, are being moved around by road almost every working day. The use of an assisting loco during loading soon fell out of use, at Bescot at least. 08939 arrives at Washwood Heath Yard with a trip freight from Landor St. This shot was taken at 11:33 on Tuesday 27th August 2002. The loco would lose its faded blue livery in favour of EWS red the following year. In 1990 a work-related training course in London enabled me to make a few evening excursions to Paddington and Waterloo with a tripod. This shot was taken around 19:30 on Monday 3rd December. 08947 has dropped onto the ECS of an inter-regional arrival, although I failed to note exactly which train it was, or what the gronk did with the stock. 08953 is stabled at Exeter St Davids and seen here from the station footbridge. This shot was taken in the late 1970s, clearly on a winter's day judging by the snow on the ground. My earliest memories of Exeter were from summer days in the early 70s, and although the infrastructure hadn't changed much in the interim, it was a different place by this stage. All the hydraulics had gone, and traffic levels on a winter Saturday were nothing like the heady summer Saturdays of eight or nine years earlier. Also on the stabling point this day were 08945, 08288 and 25057. 09013 trundles off the Uskmouth branch and into East Usk Yard with empties from (I presume) the steelworks at BSC Orb. This was taken in the summer of 1989, but I lost the relevant notebook so don't have the exact date. All I can remember of this day is that a very long time elapsed between the branch semaphore dropping off and the train appearing.